As the name indicates, the Casa Andina Private Collection Sacred Valley Peru is in the Sacred Valley. Specifically, it is the town of Urubamba. 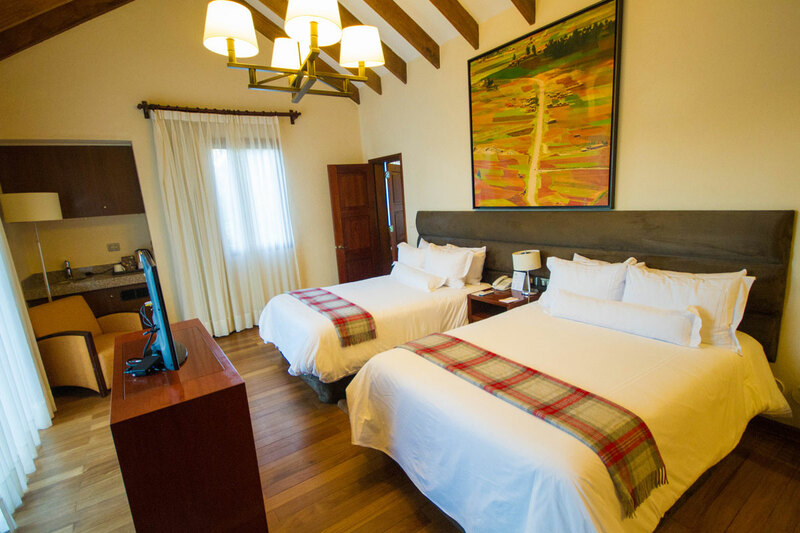 The hotel is also known as Premium Valle Sagrado Hotel and Villas. 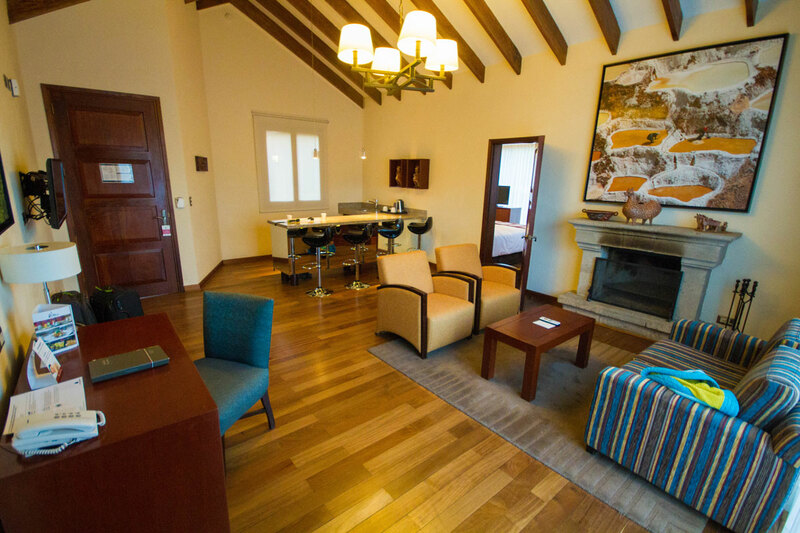 We selected Casa Andina due to its close proximity to the ruins of Ollantaytambo. It also has great reviews for its service and beautiful surroundings. The hotel has 91 rooms of which some are suites and other are villas called Andean Cottages. You can read our entire two-week Peru itinerary here. 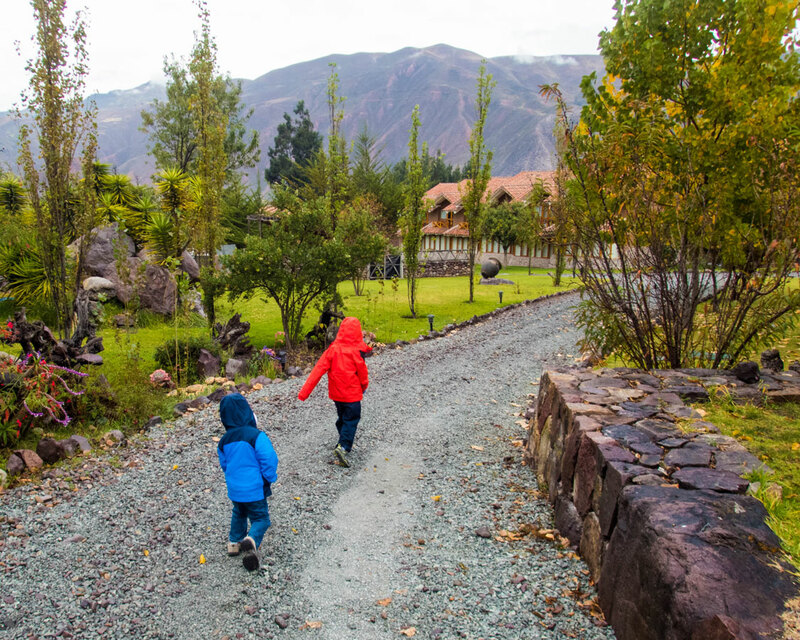 After a long day visiting Maras and Moray with kids, pulling into the Casa Andina Sacred Valley was a welcome relief. Check-in was absolutely painless. As per usual in Peru, we had to show our passports and a valid credit card for incidentals. The whole process took less than 10 minutes and we were handed the keys to our 2-bedroom Andean Cottage. The kids excitedly jumped into the golf cart which the hotel had offered to help us get our luggage up the small hill. The villas are the farthest away from the reception of all the room types. Pro-Tip: For those that who may be suffering altitude sickness, oxygen is available for purchase at a small store next to the reception desk. The villas are not really that far from the reception. The walk can easily be done in less than 5 minutes either following the road or other footpaths on the grounds. Although, the boys would call for the golf cart each time if we let them! Our Andean cottage was equipped with a kitchenette (microwave, kettle, and fridge), living room, and two bedrooms that each had their own ensuite bath and shower. The living room was also fitted with a wood burning fireplace. One phone call to reception and they quickly sent somebody to get it started for us. Off the living room was a patio that looked out onto the home of the resident llamas. It also provided a beautiful panorama of the majestic Andean mountains. The place was spotless! We were also provided with complimentary bottled water which was replenished daily. The entire place was tastefully decorated with traditional Peruvian pottery and ceramics. The walls also had paintings of famous landmarks in Peru. There was a bedroom on either end of the living room. The master bedroom had a king sized bed. 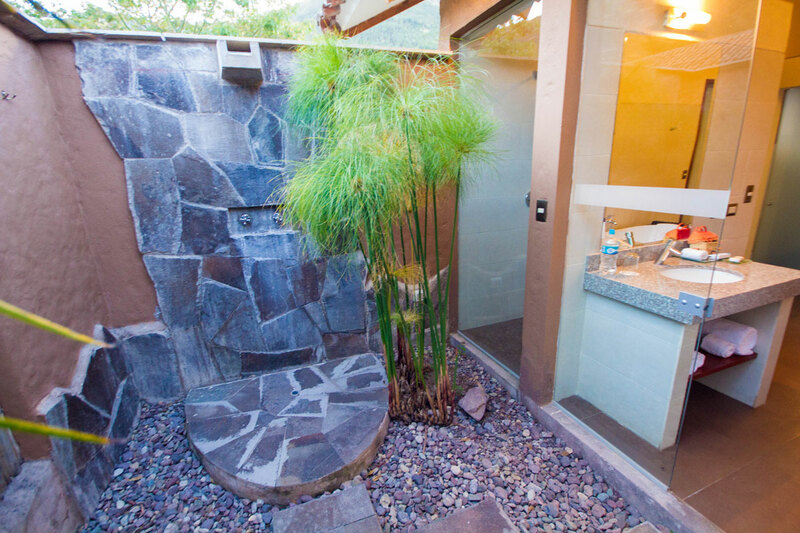 The ensuite bathroom had a stand alone tub, and both an indoor and outdoor shower. The kids’ bedroom was equipped with two double beds. It also had its own patio. Pro-Tip: With both rooms having accessible patios, be careful to lock the doors if you have a child who likes to wander. Otherwise, they may open the doors to the raised patio. We visited at the start of the dry season (May) and found the rooms a bit chilly at night. But it was handled well by the small electric heaters that were in the room. The bed and pillows were comfortable and we had a great night sleep both nights we were there. Pro-Tip: It is possible to upgrade the free internet to a high-speed version for a fee. For our purposes (checking email and social media, etc) the speed of the internet was acceptable and we did not feel the need to upgrade. You can upgrade at any time, so check out the speed first before committing to the extra charge. The Casa Andina Private Collection Sacred Valley Peru is equipped with a small gym which we didn’t have time to use but the equipment looked to be in almost brand new shape. There was also a business center which we didn’t need to use as the free wireless internet worked well even in the cottage. The kids’ favorite area was definitely the playground. Set on the far end of the massive lawn close to the reception, there is a slide, climbers, tunnel and tire ladders that our boys could have spent hours playing on. Not really an amenity but worth mentioning that the boys absolutely loved opening up the curtains in the morning to have a peek at the llama enclosure. To their delight, the llamas could be found in our “backyard” every morning tending to the grass. 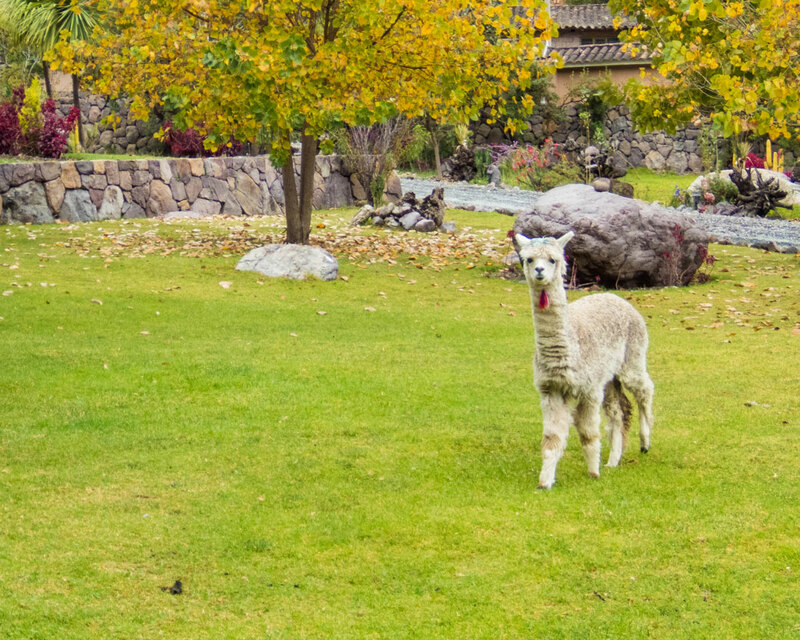 Acting as resident lawnmowers, we saw llamas wandering around at other hotel grounds we stayed in such as Hotel Libertador Puno and Hotel Libertador Arequipa. And they were always a source of enjoyment for the kids. Breakfast was included in our room rate. It was held at the only onsite restaurant, Alma Cocina Viva, which is in the same building as the reception. The breakfast was a buffet with no option to order off a menu. We did not find this to be a big deal though as there was an omelet bar and items on the breakfast buffet varied between the two days we were there. 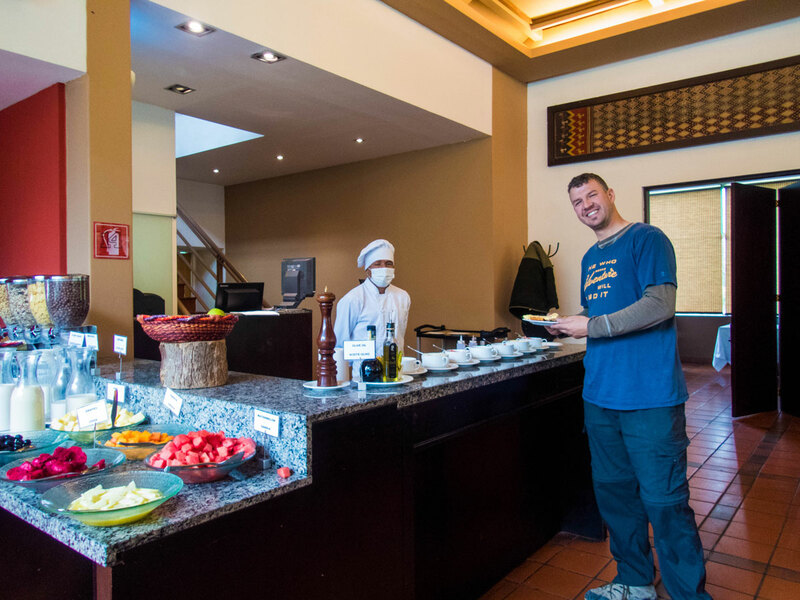 The boys really appreciated the fresh fruit juices and baked goodies which we found to be very common in all of Peru. We also had dinner at the restaurant on our first night. Or should I say I had dinner at the Alma Cocina Viva Restaurant? Unfortunately, our first night Kevin could not make it to dinner as he and the boys had caught food poisoning that day. Both the boys were just recovering but they still did not have much of an appetite. I did enjoy the Peruvian chicken creole soup while the boys split an order of ravioli filled with local corn and topped with a butter sauce. 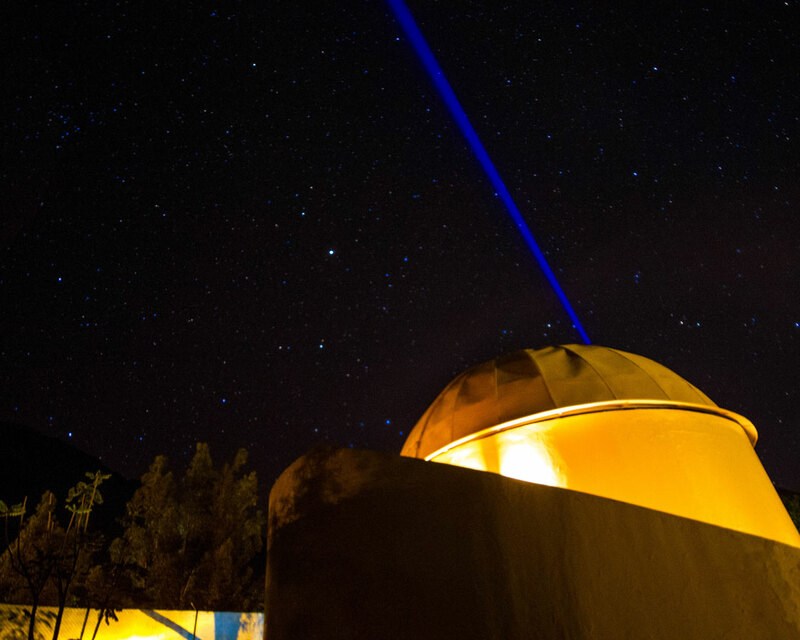 One of the (many) reasons I wanted to stay at the Casa Andina Private Collection Sacred Valley Peru was because of the onsite Planetarium and Observatory. C is obsessed with space and our solar system. And with the isolated location in the Sacred Valley of the Casa Andina Premium, it was a perfect way to learn about the constellations in the southern hemisphere. On certain evenings the resident astronomer conducts a short presentation and guests are able to see various stars using the telescope. Tours are not held daily and may be conducted in English or Spanish. Reservations must be done in advance at reception. The fee for the Planetarium/Observatory experience ($15 USD/ adult, children were free) seemed pricey at first. However, having experienced it, I can say for us it was definitely worth it. The experience starts with a lesson on southern constellations by looking at the night sky. Then it was followed by a 30-minute informative video in the planetarium about the cosmos. C and D soaked it up like a sponge. Then we headed over to the Observatory. The resident astronomer was absolutely fabulous with the children. He allowed them to set the telescope by letting them use the laptop with his instructions. He also made sure to answer all of their many questions. How could the Casa Andina Private Collection Sacred Valley Peru improve? We loved the hotel, and admit it is difficult to pick much that the hotel could do better. One item that stood out was the washroom in the main reception building. The entire resort is simple but polished and refined, however using the only bathroom available near the reception was a disappointing experience, the cement-block walls and unfinished feel weren’t up to the standard of the rest of the resort. 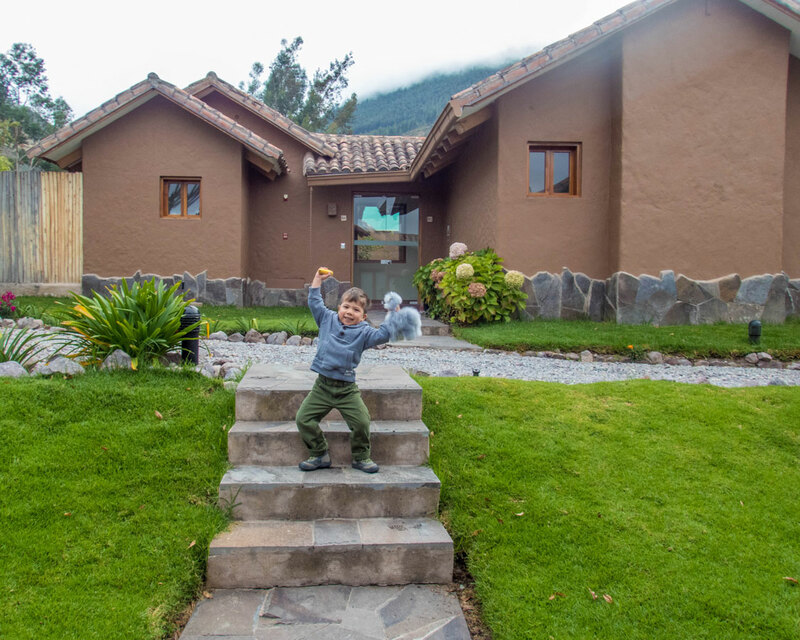 The Casa Andina Private Collection Sacred Valley Peru is perfectly suited for those that want to be surrounded by luxury and nature during their family vacation. 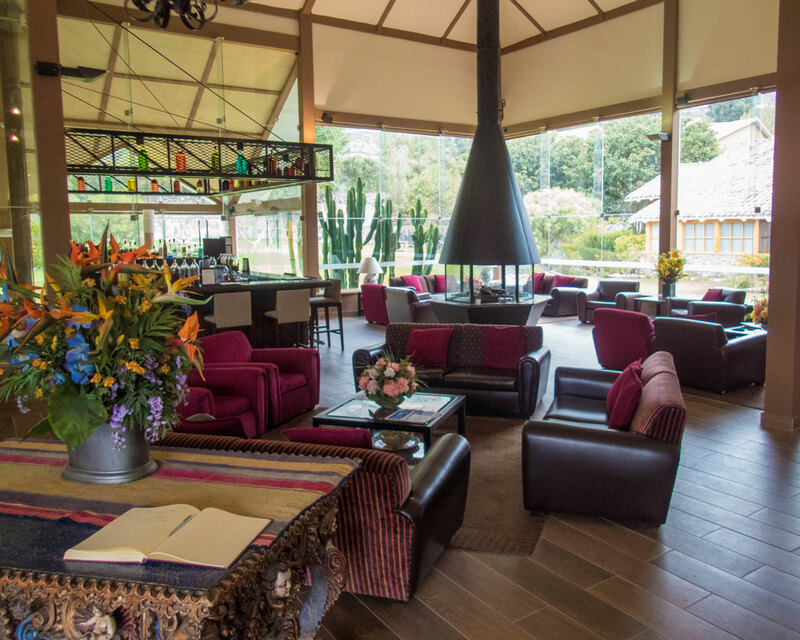 This 5-star hotel is consistently ranked among the best hotels to stay in Sacred Valley Cusco for good reason. We found the staff very friendly and attentive. 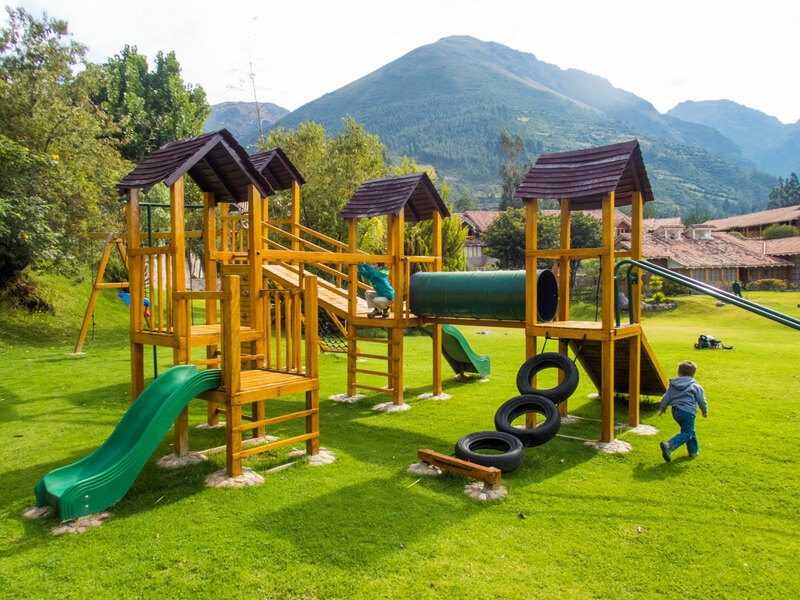 The property itself was well maintained and had nice touches that are good for families such as the onsite llamas and the Planetarium and Observatory. 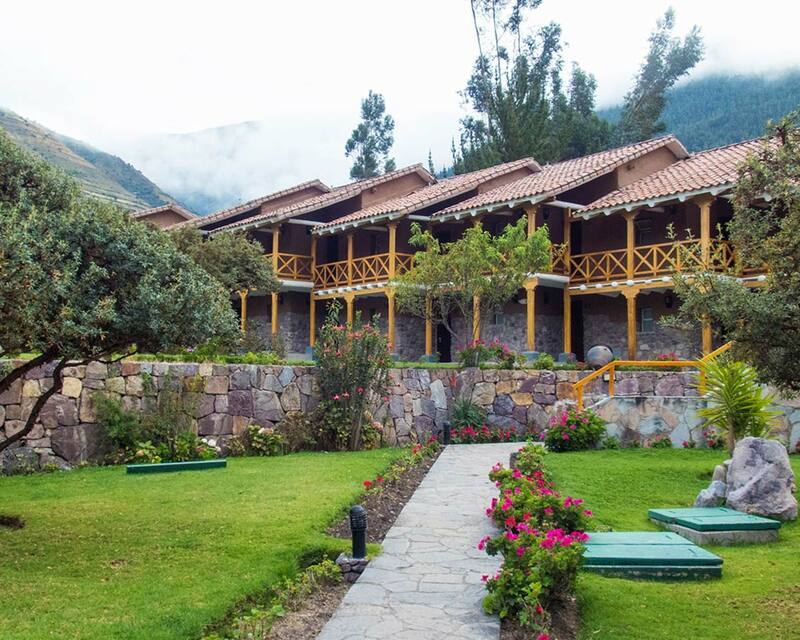 Have you stayed at the Casa Andina Sacred Valley Cusco?